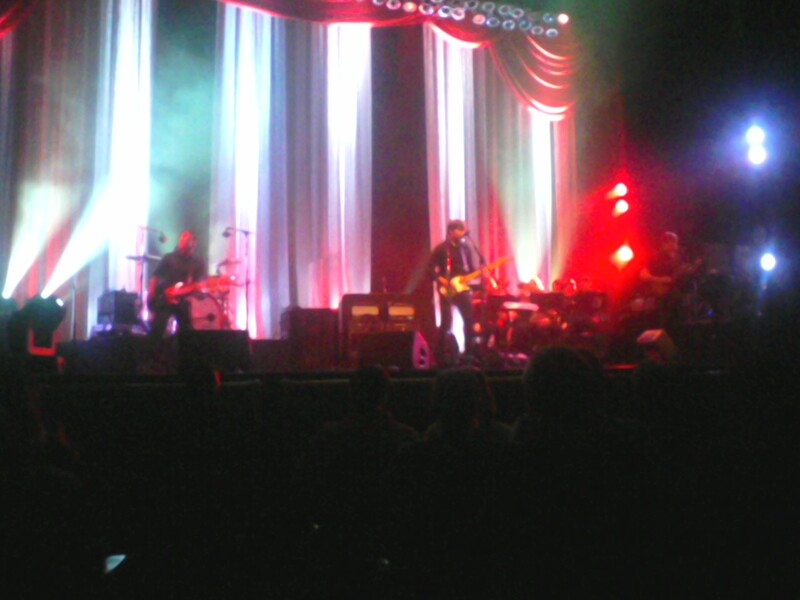 Death Cab for Cutie played their second show in a three-night stand at the Beacon Theatre tonight, 4/28. I was fortunate enough to get sixth row seats for the event, which saw the Washington band collaborating with the 8-piece Magik Magik Orchestra and conductor Minna Choi. Four songs into the show, a skinny Ben Gibbard compared the Beacon shows to a sandwich cookie: "This is the part where you take the two cookies apart and lick the frosting out. That's how good this show is." I won't bother reviewing what the orchestra adds to the songs because everyone has already said how much it improves them. While the setlists on this tour have understandably not varied considerably (asking an orchestra to learn seven albums' worth of material is a bit much), tonight's show differed from last night's by only three songs. The thirteenth song, "Cath..." was substituted with "Crooked Teeth," the encore tune "405" was replaced by a nice cover of R.E.M. 's "Near Wild Heaven," and "Your Heart is an Empty Room" made an appearance. These shows follow a formula: The orchestra accompanies the band for the set, Death Cab do a few encore songs, and the orchestra comes back to play a few more at the finale. So why don't they change up the encore songs a bit more? They even played "Near Wild Heaven" earlier this week in Pennsylvania. At least swap songs earlier in the set. Hopefully they sang and played better than last night because if I was someone who bought tickets for the hat trick, I'd probably be pissed. Fortunately for me, this was a one-off, so I enjoyed the show greatly. It could've been a little longer (like I said, seven albums), but all-in-all, a great concert to pop my Beacon cherry. Oh, yeah, think of how awesome "Marching Bands of Manhattan" would sound with an orchestra. In New York. Maybe tomorrow's audience is in for the tastiest part of the cookie.